The outrage in reporting the separation of children and parents at our southern border was absent when my young children were taken from me due to an immigration loophole. In fact TheBoston Globe issued the written version of an all-points bulletin for my arrest and embraced the manufactured plight of my immigrant husband. I was arrested and my 4 year-olds were placed in foster care. We were separated for 4 months (Mother's Day, their 5th birthday, my birthday) and one of those months I spent in jail. My government didn't rush to our aid, because my husband had successfully utilized an immigration loophole - the Violence Against Women Act (VAWA). Facing deportation in federal immigration court for marriage fraud, he filed a claim as a battered and abused spouse under VAWA and received immediate deferment; the power of VAWA. His claim was subsequently processed by domestic violence trained adjudicators at the exclusion of the immigration agents who determined marriage fraud had been committed, and at the exclusion of the immigration trial attorneys who compiled our case history in preparation for his deportation hearing. Because once an immigrant self-petitions under VAWA, the work of immigration officials outside the VAWA centralized processing center halts. Further, entering into a discussion with the American named in the claim is prohibited. There is no interview, no investigation, no due process. The claim is accepted prima facie. The immigrant accuser is accepted as the victim and the American accused is accepted as the abuser. The need for the American spouse to sponsor the immigrant spouse's stay in the U.S. is officially terminated and VAWA steps in as the surrogate sponsor. The current focus on closing immigration loopholes should carry-over to the VAWA-fraud/immigration-marriage/due process loophole as we approach VAWA's reauthorization this year. The disparity with the VAWA loophole is particularly troubling because it requires the destruction of the American spouse by the immigrant accuser in order for the immigrant to move through the system without the American or the marriage. As implemented, again, without due process, VAWA is not only creating a new class of victims in the falsely accused American spouse, but also facilitating the defrauding of our immigration system. Marriage fraud has long been a concern. In 1986 Congress passed the Immigration Marriage Fraud Amendments (IMFA) in an effort to protect U.S. citizens from marriage fraud and protect the integrity of the U.S. immigration system. IMFA require a two-year evaluation period to determine if the marriage is valid before the conditional immigrant spouse is eligible to apply for lawful permanent resident (LPR) status, a green card. In 1994 the Violence Against Women Act (VAWA) was passed, stripping IMFA of those protections. A VAWA self-petition overrides the requirements established by IMFA, essentially assisting the petitioning immigrant in circumventing immigration law, and leaving the American spouse vulnerable to fraud. The only protections in place at this point, are those guaranteed to the immigrant through the structure and processing procedures of VAWA. guilty of marriage fraud through the processing standards in USCIS offices, can dodge deportation by way of an abuse claim. A VAWA self-petition nullifies the case work compiled by immigration officials and precludes the case file from further consideration. The immigrant spouse begins anew as a VAWA self-petitioner. VAWA claims are adjudicated solely by domestic violence trained personnel under VAWA instructions at the Vermont Service Center (VSC); the single decision-making body for all VAWA claims. Adjudicators at VSC determine the legitimacy of a claim based on the application by a pro se applicant; evaluations rely entirely on the documents provided by the immigrant on the immigrant's behalf, devoid of a face-to-face interview. Confidentiality safeguards prohibit disclosure of the filing to the accused American spouse eliminating the opportunity to refute the claim. VAWA adjudicators have sole discretion to approve or revoke a claim, and once a petition is approved it is not subject to review. 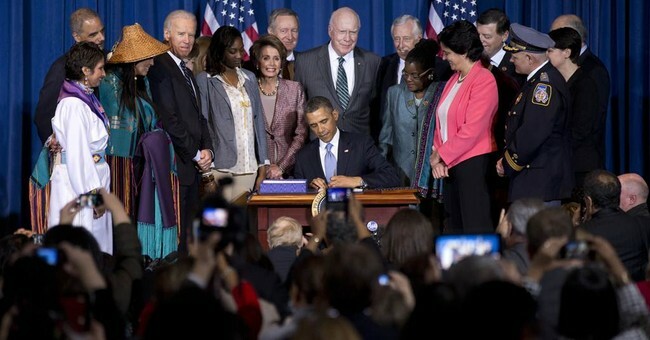 Members of Congress took notice leading up to VAWA's last reauthorization. In July of 2011, the Senate Judiciary Committee held a hearing, The Violence Against Women Act: Building on 17 Years of Accomplishments. For the first time since the Violence Against Women Act was signed into law, questions about the misuse of VAWA to defraud U.S. citizens and U.S. immigration law were addressed. I testified before the committee at that hearing, a guest of then-ranking member Senator Chuck Grassley. I shared my personal experience with how VAWA works in practice and the consequences my children and I suffered as a result. My testimony was evidence of the damage caused when guilt is assigned to the innocent and the immigrant is rewarded with a green card. Republican proposed legislation calling for anti-fraud provisions out of the House and Senate failed. VAWA is a partisan issue and Democrats were quick to accuse Republicans of waging war on women and labeling anyone who supported the argument for due process anti-immigrant. Denying the constitutional right to due process is anti-American. In the absence of judicious decision-making where vulnerable immigration policy is concerned, fraud flourishes. This is especially true for the immigration provisions of VAWA.